Yeah. I know. Not much of a ball. BUT they are sooooo good and this gift was someone specific. The person these were made for likes Peanut Butter Chocolate Chip Cookies so I hope that she likes the dough balls. 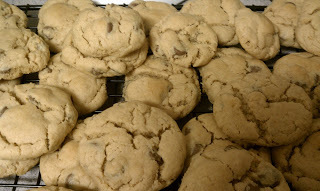 It reminds me of the chocolate chip cookie truffles but more of a cookie form. It was also nice that the recipe didn't call for anything out of the ordinary (for my house anyway). Beat butter, peanut butter, sugars and vanilla in the bowl of a stand mixer until fully incorporated. In a separate bowl, combine baking powder, baking soda, salt and flours. Slowly add the flour mixture to the mixer bowl and mix until a dough forms. Stir in the chocolate chips. Chill for 30 minutes. Preheat your oven to 350 degrees. Scoop dough with a mini ice cream scoop, roll into a ball and place on a cookie sheet. Bake for 10-12 minutes. They’ll still be soft and look much like they did going in, but don’t overbake. The bottoms will be very lightly browned. Let the dough balls rest on the pan for a minute before transferring to a cooling rack to cool completely.